Take your winter jacket, gloves, and hat out of storage along with your winter boots. Keep the yard tidy now and reap the rewards in the spring. Be sure to change the battery in all smoke and carbon monoxide detectors in your home. Taking care of the tasks on this winter checklist will help get your home through the colder months and make next year's spring cleanup a breeze! 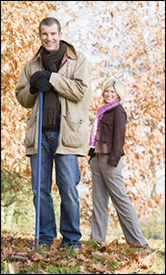 A little work now can go a long way in preventing any discomfort during the wintertime, as well as allow the whole family to participate in these activities. Free Take Home Whitening Kit! Congratulations to the winners of our Spoooky Fall Giveaway, Paulla Beaudoin-Casquiera, Kadie Ann Hylton and Ana Quintal Wang. Enjoy the movie and dinner at Jetsun's Juicy Burger! We're giving away one Opalescence Treswhite Supreme kit with each new patient exam, full mouth x-ray and cleaning. This offer is open to all current and new patients of Lawrence West Dental over the age of 18. Click Here for more details! Don't forget, November 15th is a PA day for both elementary and high school students. Contact our office to schedule your kids in for their dental visit. If you miss this opportunity, there will be one more PA Day coming up on December 20th. Book early to avoid the rush! 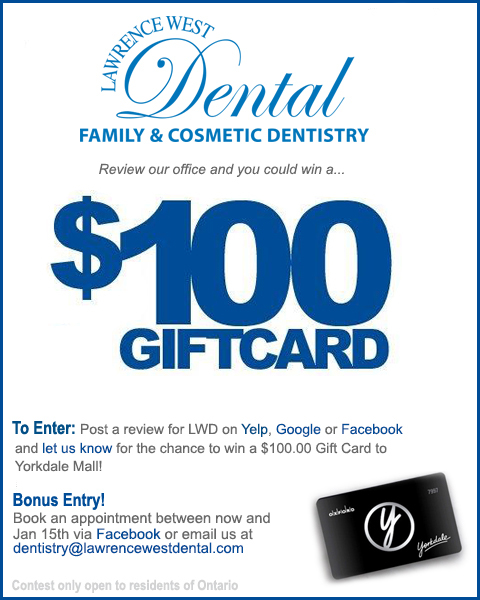 Post your review on Google or Yelp then forward your review to: contestlwd@gmail.com to be automatically entered in our contest to win $100.00 Gift Card to Yorkdale Mall...Just in time for the shopping season! 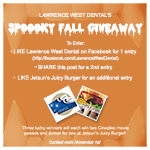 Bonus Entry: Book an appointment between now and Dec 13th via Facebook or email us dentistry@lawrencewestdental.com. Is Your Smile All It Can Be? Many people have a missing tooth in the back of their mouth. Since it's not visible to others, they often feel that this is not a problem but that is not entirely true. While you may not be able to see the missing tooth, you do run the risk of having the surrounding teeth drift out of position. Missing teeth also cause teeth and gums to become more susceptible to tooth decay and gum disease. One of the solutions we offer to our patients with missing teeth is a dental bridge. A dental bridge is a false tooth, known as a pontic. It can be used to replace one or more missing teeth. Bridges can do many things, including reducing your risk of gum disease, help to correct minor bite issues, and can even improve your speech. If you'd like to know more about how a dental bridge could improve your smile, click here. The Bank of Canada recently announced it would hold the Benchmark Interest Rate at 1 percent, where it's been for more than 3 years. This will likely have a calming effect on other rates over the near-term, as the Bank's reforecast points to a weaker than expected 4th quarter. Unlike previous rate announcements, the Bank of Canada is no longer hinting that our economic engine is revving or that interest rates are poised to go up. Earlier this month, Bank of Canada Governor, Stephen Poloz confirmed that economic growth is behind where it was forecast to be a year, or even six months ago. While the Bank of Canada's position on low rates may seem negative - there is likely a silver lining of "steady as it goes" for mortgage interest rates. Guacamole with peas, who knew they'd make a perfect pair? Why with peas? Not only do peas give this dip substance, they also add fibre, protein and vitamins. Avocados are full of healthy essential fats, extremely satisfying and make a great base for a dip. There are so many great ways to enjoy this delicious guacamole. Try it with corn chips, on sprouted bread, in a wrap or topped on a salad!